Ping Irvin, (Yunping Ma) is an artist who grew up in Kunming, China. Her beautiful work is reminiscent of Frida Kahlo, Paul Klee and George Braque. Her family name, Ma means horse in Chinese, and the horse appears in many of her paintings . Ping graduated from Yunnan Art College in 1982, and was awarded a professorship in 2003. 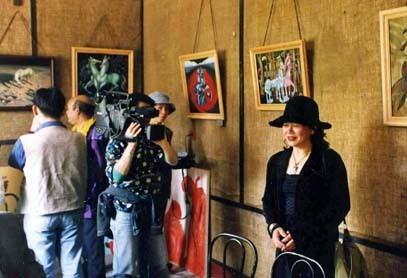 She won first prize in the National Chinese Exhibition in 1982 for the oil painting,Return which was published in the book, Chinese Fine Arts, the Excellent Works Collection"
A world-class artist, she has collectors in China, Thailand, Switzerland, Germany, Japan, Mexico and the United States. She is also listed in, "Whos Who in the Art of Modern China" and "The Biographic Dictionary of Chinese Artists"
After marrying fellow artist Craig Irvin, she began to show in the United States extensively mostly in the South, Mid-West, and Southwest.